Good Monday morning to you! This day feels particularly fresh and exciting since it's the first Monday of the new year. So many wonderful days lie ahead, and we're so glad that you've chosen to pop in and spend some time with us. It's my pleasure to introduce to you two more members of the My Favorite Things Challenge & Inspiration Team. Jill and Veronica have been personally wowing me for some time, and I'm thrilled that now you get the chance to be wowed, too! Jill Dewey Hawkins is an Illinois native with a penchant for extreme and endearing overuse of exclamation points and emojis. But don't let that fool you — she has a Master's Degree in Architecture and spent nine years as a Project Coordinator in a small Chicago firm doing high-end residential work on Michigan homes. She met her husband (also an architect) at a previous firm, and they have one son, Emmett. 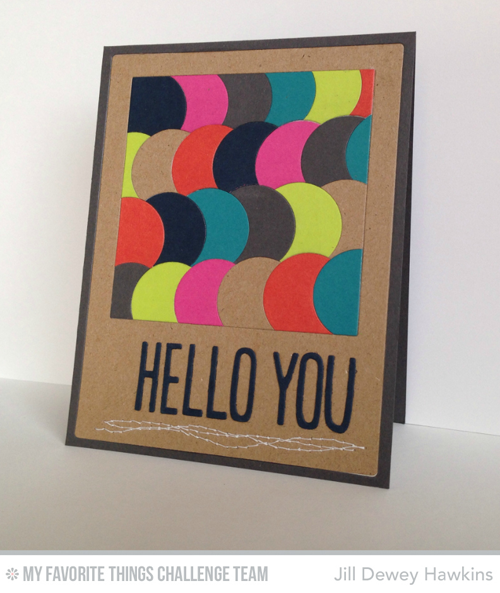 Jill became more involved with card making in 2009 when she started entering weekly challenges (how great is THAT?). Eventually she sent in a card submission for publication in a magazine, and as she says, "Bam! Pure joy!" From there she's enjoyed this hobby and has spent time honing her skills, refining her style, and appreciating the talent of fellow card makers. 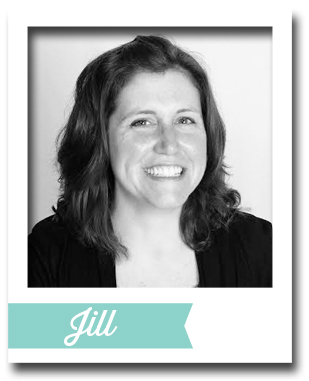 Jill describes her style as graphic, geometric, and understated which makes sense with her background in architecture. She's a whiz at inlaid die-cutting, and she wants to try using paste with stencils. 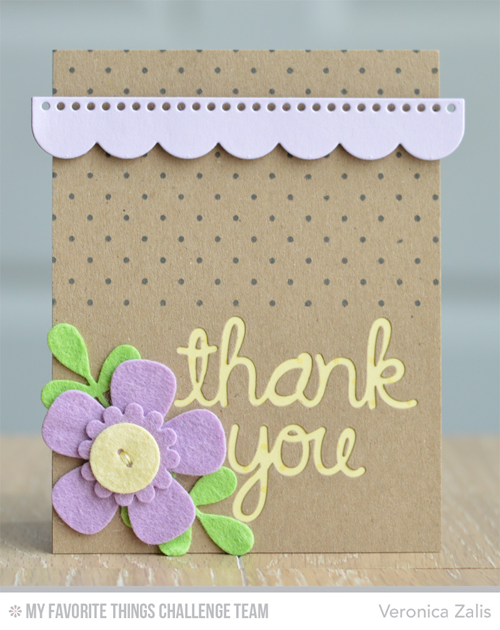 When it comes to inspiring card makers, she's definitely a fan of My Favorite Things Design Team member, Teri Anderson! Veronica Zalis was born in Utah, but after a visit to her great grandparents' home in Oklahoma when she was two, her parents sold everything and moved. You'll definitely catch a sweet Southern gal vibe from her. After ten years working for WalMart at the corporate offices in Arkansas, Veronica has settled into the routine of wife and mom to two boys ages 4 and 7. Her oldest is non-verbal Autistic, but she and her husband feel blessed knowing that some parents have so many more challenges than they do. Veronica inherited her creativity from both of her parents. She remembers falling asleep to the sound of her mother's sewing maching working deep into the night, and many an afternoon was spent sitting at the kitchen table with her father with a set of paints and blank sheets of paper. In 2003 , she was invited to a neighborhood card swap, and it's been full steam ahead since then. 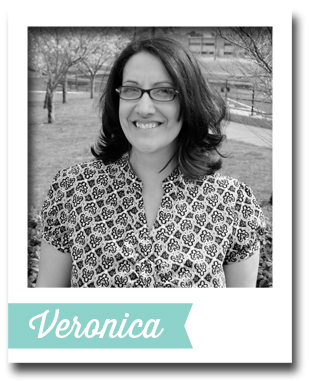 Veronica describes her style as feminine, detailed, and layered. She's a whiz at multi-step stamping, and you'll often find soft and homey touches like flowers and quilts in her designs. There's just something so pretty about whatever she makes! You can definitely see Veronica's feminine style in this card with soft pastels, polka dots, and scallops. The addition of layered felt adds the perfect amount of sweet hominess. Be sure to say hello to Jill and Veronica and stop by their blogs, too! And if you haven't already, join our Facebook group to connect with like minded friends. YAY, Jill and Veronica!!! Lovely cards! Love your write-up, Susan! Love these talented designers and their work! What a great way to start my Monday here! Very cool looking forward to it. I see both of you use dies in creative ways! Welcome Jill and Veronica, Thanks for sharing your wonderful cards. Two more wonderful designers! Looking forward to their inspiring work! Geometric... my kinda gal:-) go girls! 2 more designers that are sure to inspire me! TFS. Looking forward to the challenges and being able to grow creatively! Super cards and awesome cleverness! That sewing-on-a-card business? My favorite thing!